Thought I’d write a short post in the Tips & Tricks category for a change. As most women, I love nice shoes and can’t keep my hands of Mr Louboutin’s creations :). However, I think all nice shoes should be worn frequently irrespective of occasion or weather, and that unfortunately is poison to Louboutin’s beautiful red soles. A night of dancing or a couple of outings will wear out the red leather under the ball of your foot. And once the red color is worn through your soles don’t look hot at all. Now there are a couple of things you could do. If you have your ways through Paris you can stop by Minuit Moins Sept at 10, Passage Véro Dodat, 75001 Paris. 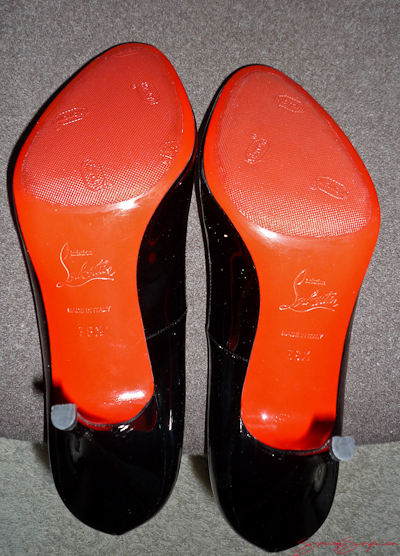 Alternatively, you can have them apply a custom-made Louboutin rubber sole to the ball area at approx. $50 per pair. I like this option more as it gives you longevity, but personally I don’t like the way they apply the rubber. As you can see from their website, they will apply the rubber over the entire sole. This means that the “edge” of the rubber is slightly visible from the side, and it looks like you have an additional layer under your shoe. Also, personally I’m not a fan of the obtrusive Louboutin branding of the rubbers. So hence I tend to go with my own semi-DIY variant (pictured below). What you do is you get on Ebay and search for “Red Vibram”. You’ll find a lot of people selling red Vibram soles “for Louboutins”. Be mindful, however, to buy the special 1 millimeter thick version, not the regular 1.8mm variant. 2) she will first cut the Vibram’s to fit the under the ball of the foot, leaving approx 2-3 millimeters to each edge. 3) she will then sand or strip away a thin layer of the red sole where the Vibram patches will sit (yes, she will be cutting in your red soles, better you are not there to see it). 4) She will glue on the Vibrams applying pressure so that they attach snugly. And voilà, as a result, the Vibram’s will “sink into” the soles so that they are completely invisible from the side of the shoes. Also, as opposed to the patches the French cobbler uses, your Vibram is thin and kind of shiny and will be nearly unnoticeable even if you are sitting with your soles visible. However, the Vibram’s will be protruding just so much that the weight of your body rests on the Vibram patches while the bordering 2-3mm red leather sole remains intact. So with these you can enjoy your red soles much longer. It is also easy to wipe down the Vibram patches with a wet cloth so they stay nice and red. Hope you enjoy the post and good luck with your DIY project! You’ve worn these? They look so clean and new. Just purchased the LB Lamu’s in black leather and I’m dreading wearing them! Not sure if I want to go with the Vibram’s or go bare! I’ve seen what the cobbler does to the shoe to adhere the rubber sole and it makes me cringe! What is a girl to do!!! Thanks for sharing, I have one pair with the rubber protection, one pair without any protection and ballerina’s. I decided, as they are shoes eventually, I just wear them and ger it’s soles fixed when all the red is gone. Only costs €80 for me! Glad you like the post Sabine, and yours is sure a good way to go too; it also gives you more reason to buy another pair when the previous are worn through Where can you get the re-soling done for 80, please?